One of the most heartwarming parts of the holidays is watching your child's face light up as they open up the perfect gift. But what if you're having a difficult time finding that perfect gift? 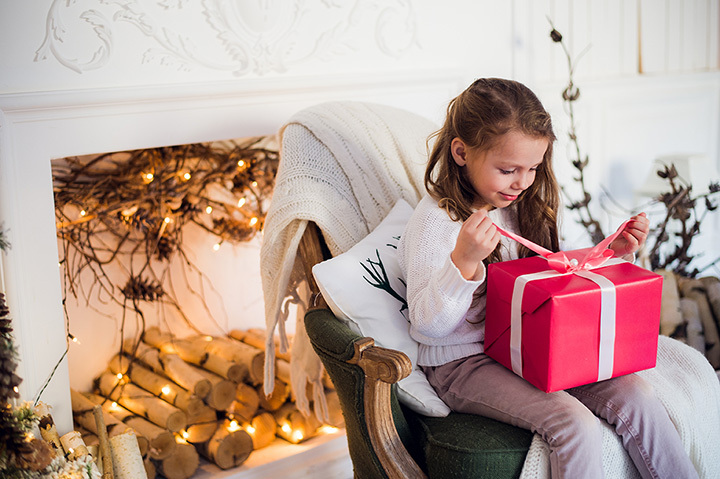 From the hottest electronic and highly-interactive toys, to the perfect game to bond with the family, to the ideal gift for a creative mind, look no further than this essential holiday gift guide. Hatchimals are one of the hottest toys this holiday season. Hatchimals are small interactive "animals" that come in eggs where they will then hatch when held and rubbed. Once hatched, unique animals are inside, such as a bearakeet, owlicorn or a penguala. Pokémon is back, and it's no surprise that this Pokémon Z-Ring is on the most-wanted gift list for kids this holiday season. The Pokémon Z-Ring increases the game experience of the wildly popular Nintendo 3DS Pokémon games, Pokémon Sun and Pokémon Moon. The Z-Ring creates an interactive experience with these Nintendo 3DS games. Anki's Cozmo Robot is a robotic friend that has an evolving personality the more you hang out with it. Cozmo is complete with facial recognition, hundreds of emotions and even some pretty great dance moves. All you need to work Cozmo is an Android or iOS device. Mattel's View-Master has come a long way. This virtual reality experience allows you to explore places you never would have before. The View-Master is best with "Experience Packs" where you can explore space, the natural environment or even the world of Batman. The Pie Face Game has become one of the most hilarious and suspenseful games of the year. The rules are easy. Place whipped cream or a wet sponge on the "hand" of the game system, turn the knob and hope for the best. The winner is the person who can turn the handle the most without getting "pied." This is a perfect, family-friendly game. Lincoln Logs have been entertaining young creative minds for years, 100 years to be exact. The Lincoln Logs 100th Anniversary Tin comes with 111 wooden pieces that were made in in U.S. Use the logs to build log cabins or a structure from your own imagination. For kids obsessed with the DreamWorks' "Trolls" movie, Build-A-Bear has come out with a line of Trolls dolls complete with outfits, accessories and sounds. The Trolls Build-A-Bear collection includes the characters of Poppy, Branch, Guy Diamond and Cooper. These stuffed animals are sure to put a smile on a Trolls fan's face this holiday season. FurReal Friends has come out with a friendly electronic Dragon named Torch. Torch is an electronic plush pet with 50 different sounds and motions. This engaging dragon even eats, burps, and breathes out mist. Snuggles, an electronic puppy from Little Live Pets, is a great alternative from the real thing. Feed Snuggles a bottle and this adorable robot will fall asleep in your arms. This interactive toy has a variety of reactions when you pet its stomach or rub its head. It's the perfect, no-mess best friend. The Crayola Emoji Maker takes a technological obsession to a creative, artistic platform. Create your own colors and use the stamps of 16 popular emojis to add these modern details to notes or drawings. This award-winning toy brings our favorite emojis, like the winky face and pizza slice, to life on paper. The Furby is back but has modern features to make any kid happy. The Furby Connect connects to the Furby Connect World app, where you can feed Furby and even raise virtual Furblings. Furby Connect comes in a variety of colors and features 150 eye animations, making this virtual pet truly seem alive. Enjoy karaoke anywhere and make your own music videos with the SelfieMic. The SelfieMic features an adjustable selfie stick with a microphone and earpiece. The free app allows you to sing along to your favorite tunes. The VTech Kidizoom Smartwatch is a durable smartwatch that includes eight games, enough memory for lots of pictures and videos, and 50 3D clock displays. This watch is perfect for budding photographers or young techies. A smartwatch wouldn't be complete with the common features of an alarm, timer, stopwatch, calendar and calculator. Create 3D art with this awesome 3D pen set. Use the guidebook or make your own creation with various ink colors that cure in minutes. This gift is perfect for the artist or craft lover. This learning toy from Fisher-Price teaches preschoolers to think critically to get Code-a-Pillar moving. Code-a-Pillar has segments, that can be arranged in endless combinations, to make this toy move in a variety of directions and with different lights and sounds. This toy truly fosters experimentation and problem solving skills.